Jack’s has replacement AYP/Electrolux pulleys for your lawn mower maintenance or small engine repair. If you need lawn mower pulleys, Jack’s is the place to check first. Look below to find the type of replacement AYP pulley you need. 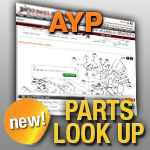 Replacement parts to fit Poulan, Sears, Craftsman, Husqvarna lawn mowers tractors made by AYP (American Yard Products).